Every year, the Jewish Center of the Hamptons joins with congregations around the world to commemorate Yom Hashoah. We began many years ago joining with B’nai Brith in a ceremony of reading the names of those who perished in the Shoah. In its inception, it was brought to us by one of our congregants, Sam Latner z”l. The next chairperson was Dr. Alan York z”l and after his death Charlotte Sasso took over as chairperson of this very important ceremony. We no longer participate with B’nai Brith, but we do continue, every year to read out the names of those who lost their life. Every year, we ask those from our congregation who have family members to remember to give us their names so we can call them out for sacred memory. We hope you will join us for this service. Please contact the Jewish Center office at 631-324-9858 if you have names of loved ones lost in the Shoah to include in our Holocaust Memorial Service. May their memories forever be for a blessing. We invite you to pick up a Yellow Yahrzeit candle to light in memory of those whose lives were tragically cut short. The yellow wax reminds us of the yellow arm bands that Jews were forced to wear. 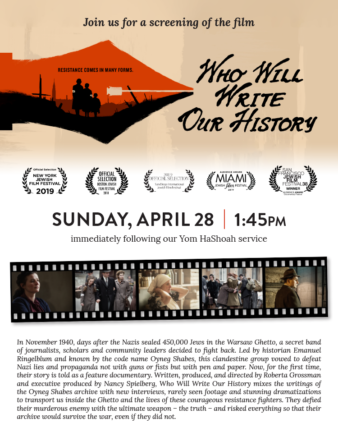 We hope you will join us for this service followed by a special screening of the film “Who Will Write Our History” at 1:45pm.